The modern state of Jordan is home to some of the finest relics from the ancient world; a journey through Jordan will introduce you to the many precious jewels of the Hashemite Kingdom. Start in the capital of Amman by visiting the ruins of the Amman amphitheater, the citadel and the Ummayad Palace. From Amman you can visit the powerful Greco-Roman Decapolis cities of the north, Um Qais and Jerash where you can wander along streets that still bear the marks of chariot wheels. Travel south from Amman along the King's Highway, an ancient caravan route that passes through some of Jordan's most dramatic, splendid scenery and visit Mt. Nebo and Madaba which today houses wonderfully preserved examples of Byzantine mosaics and the Crusader Castle in Kerak where you can admire the view of the Dead Sea from Mount Nebo. The most precious glittering jewel in Jordan's crown is the legendary rose city of Petra - voted one of the New Seven Wonders of the World; here you can spend a full day savoring the myriad wonders of this desert city and in the evening experience the beautiful atmosphere of Petra by candlelight. Continuing on to the stone canyons and sandstone mountains of Wadi Rum where Bedouin nomads still erect goat-hair tents and live a simply life that has not changed for centuries. For relaxation travel south to the Red Sea Resort of Aqaba; here you can enjoy swimming, snorkeling or viewing the coral from the comfort of a glass-bottomed boat. 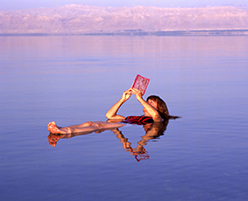 Finally you must experience the crystalline shores of the salt-laden Dead Sea, the lowest point on the surface of earth, here you can take a short float in the warm salty waters or pamper yourself with one of the many therapeutic spa treatments that are available leaving you revitalize for your journey home. 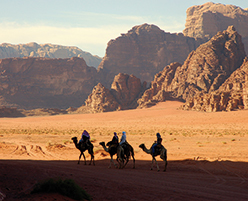 The Jordan Valley and the area around Aqaba is warm during winter (January-February) with chilly evenings, and extremely hot in summer (June-August). Rain falls between November and March. Nationals referred to in the chart above can obtain a one month, single-entry visa on arrival at any point of entry in to Jordan except for the King Hussein Bridge at the Jordan/Israel border. The cost of a Single Entry Visa is JD20.00 (approx £18.00). Passports must be valid for a minimum of 6 months after the period of intended visit. Inoculation regulations can change at short notice. Please take medical advice in the case of doubt. Where 'Sometimes' appears in the table above, precautions may be required depending on the season and region visited.